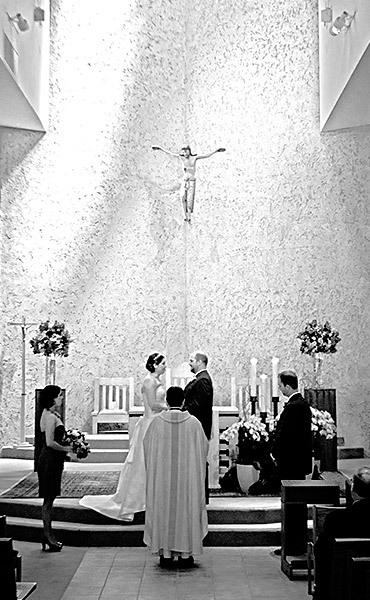 Couples who would like to celebrate their wedding at St. Timothy Church should contact the parish office for a pre-registration form at least six months prior to the wedding. Wedding dates and times should not be set before meeting with a priest and scheduling marriage preparation. Preparation programs are mandatory for couples before marriage in the church; the two most popular being Engaged Encounter and Marriage in the Lord. We look forward to celebrating the Sacrament of Matrimony with you; please call and begin the process as soon as possible. If you wish to view our Marriage Protocols for St. Timothy, please feel free to do so as well as download and complete our Marriage questionnaire and kindly return it to the parish.